Passez vos vacances dans le luxe lorsque vous passez vos vacances dans «Shooting Star». Cette maison de 6 chambres située dans le club Currituck dispose de 3 suites Master. Profitez des couchers de soleil spectaculaires sur le Currituck Sound depuis les différentes terrasses et passez des journées reposantes au bord de la piscine privée, dans le bain à remous ou profitez des repas à la table de pique-nique dans la cour. Au niveau supérieur, le concept ouvert permet de grandes réunions de famille avec une grande salle voûtée, une télévision à écran plat, une salle à manger (10 places) et un îlot de cuisine (6 places). Une suite King Master avec salle de bains privative avec douche et lavabos carrelés et télévision à écran plat. Il y a aussi une demi-salle de bain située sur le palier jusqu'à ce niveau supérieur. King Master Suite avec salle de bain privée et accès porche à l'avant de la maison. Queen Master Suite avec salle de bain privée et accès terrasse à l'arrière de la maison. Sur le côté opposé de cet étage, deux chambres Queen ont chacune une demi-salle de bain et partagent une baignoire / douche entre les deux chambres. Toutes les chambres de ce niveau disposent d’une télévision à écran plat. Il y a aussi un beau salon au centre de cet étage avec accès au pont. Les enfants apprécieront leur espace avec une chambre au niveau inférieur qui dispose de 2 lits superposés et donne accès à la salle de jeux. La salle de jeux comprend un bar, un grand réfrigérateur, une télévision et une table de baby-foot. Il y a un espace laveuse / sécheuse et une salle de bain complète au rez-de-chaussée. En tant qu'invité de cette maison, vous pourrez également profiter de tous les équipements du complexe Currituck Club, notamment des piscines communautaires (fermées d'octobre à mai), du tennis, du basketball, du volleyball, du centre de remise en forme, valet de plage, Surf Shack, accès surveillé à la plage et pistes cyclables. Il existe également un parcours de golf de championnat semi-privé de 18 trous, conçu par Rees Jones, qui s’enroule dans tout le quartier et le long du détroit de Currituck. Went for a family get together. I love the Currituck Club and have stayed before. The community is awesome. The location is fantastic. I felt that the house was not as clean as I would have expected but I guess clean enough. I also felt that the blankets on the beds were just gross and no effort was put into the furniture or linens. Everything is extra cheap. I understand that it’s a rental but I’ve had much better houses within the community. Thank you for providing valuable feedback. We are sorry the cleanliness did not meet your expectations. The cleanliness of our homes is very important to us, and we have taken steps to improve our housekeeping processes for future guests. We hope to host your family again! Let me start by saying this house and community are absolutely amazing. Our family would vacation here again in a heart beat. The management company on the other hand were disappointing. Our scheduled checkin was for 400 p.m. and our family had just driven over 7 hours. When we arrived and saw the cleaning company still at the house that was a bad start. We called and asked when the property would be ready and they said they would check and get back to us. That never happened and we had to call back and find out that it was ready after waiting over an hour. Then we get to the house and the sliding door is shattered with loose glass exposed. They never even disclosed, so we had to call back and get it properly secured to prevent our little guys from getting hurt. When they came out they disclosed that the previous renters had shattered the door and it would be replaced as soon as possible. That never happened, the door remained shattered the entire time during our stay. Again, amazing house and community just disappointed in the rental company. Thank you so much for bringing these issues to our attention. Unfortunately from time to time it can take a little longer to completely prepare an amazing home for you and your family. The sliding glass door was broken the week before your stay, and although we tried our best to expedite the restoration process the door was not completed during your stay. We apologize for not contacting you about the door beforehand. We are so glad you enjoyed your stay and we hope to have your family as our guests in the future! The house was very accommodating for our group of 11. It was very clean and decorated with tremendous charm. The kitchen was laid out very well for many cooks. The pool area and hot tub were well maintained and perfect after a day at the beach. The staff on the trolleys, the beach valet service, at the pools and in the clubhouse were beyond professional and super friendly. We could not have asked for a better week. My family and extended family spent a week at this home end of July. We were 12 adults, 3 kids and 2 infants, and the house suit us perfectly well! We were all extremely comfortable and happy. The rooms are great size and bright. The place was spotless upon arrival and nicely equipped. The kitchen is large and modern. The living room is spacious and the large dining table and outside deck allowed for dinners all together without any issues. The pool and back yard are private. The location is perfect! Inside a peaceful neighborhood, near the beach, with the option of taking the Trolley just around the corner. My sister in law enjoyed the community gym every morning. I highly recommend this house for a family vacation! Thank you for the great review of the Shooting Star home and your recent vacation with us. 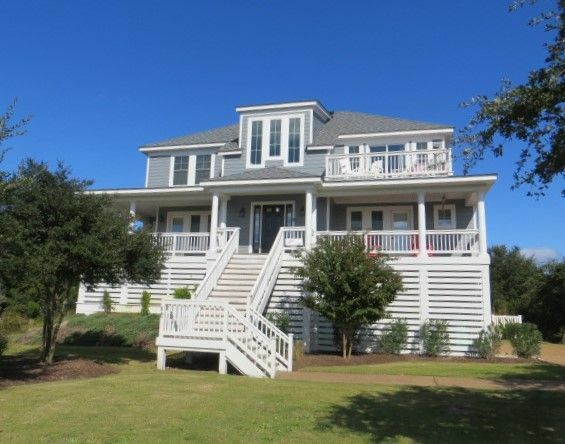 We are happy you enjoyed the home as well as The Currituck Club facilities, the beach, etc. We certainly look forward to you joining us again in 2018 and for many years to come!